First Lutheran Children’s Program is licensed by the state of Maine. We are proud of what makes us a highly rated childcare provider serving the greater Portland Community. Our preschool program is nationally accredited through NAEYC; this means that we adhere to the highest standards of quality childcare. 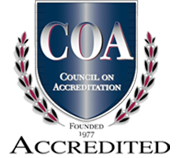 Our School Age Care program is recognized as a nationally accredited program through the Council on Accreditation (COA); demonstrating that our program successfully delivers the highest quality services to all of our children, youth and families. First Lutheran Children’s Programs has a Step 4 Rating from Quality for ME – this is the highest rating by the state of Maine. Our valued staff is at the heart of what has made First Lutheran Children’s Programs a high-quality childcare provider for kids ages 1-12. All of our teachers are dedicated to nurturing each child in their own unique development and providing a warm atmosphere where kids grow and learn. The majority of our staff holds a degree in early childhood education. Preschool staff are members of the NAEYC (National Association for the Education of Young Children). All staff, School Age Care and Preschool, are members of the Maine Roads to Quality: Early Care & Education Career Development Center, which promotes and supports professionalism in the early care and education field.